I'm not an Art Guy. I think I'm quite terrible at talking about colour choices and golden ratios and negative space and all that gubbins. I generally don't take a lot of interest in art, partly because I feel like I lack some core critical tools to really appreciate it. For reasons like this, I prefer the simplicity of stuckism over conceptual postmodern art - I feel much more comfortable looking at face-value paintings of sharks than I do when I'm walking between two halfs of an actual shark suspended in formaldehyde. I'm not sure if 'reconceptualising what it means to be inside a shark' is really worth such a macabre display. But hey, each to his own. That said... I am absolutely in love with René Magritte. Your header image here is his famous 1929 piece The Treachery of Images. It expresses a lot of what I love about his work - exploring the philosophical boundaries between fiction and reality. To give my own quick explanation of the piece: He's painted a pipe, and underneath he's written "this is not a pipe" (in French, obviously). It seems like a jarring juxtaposition - of course it's a pipe, look at it! - but the truth is that it is an image of a pipe, not an actual, literal pipe you can pick up and smoke. The point of this piece is not to show off how good he is at painting pipes, but to challenge the audience to question where they draw the line between fantasy (the subject of the image) and reality (the image itself). This is taken from the 1933 rendition of The Human Condition. I've cropped it a bit for the sake of page formatting, but you can see the full version here. This painting is a bit less explicit in its message, given that he didn't literally write it across the canvas this time. To summarise: He's painted a scene of a window looking out onto a nice patch of countryside, with an easel and canvas set up in front of the window, and a painting on the canvas which appears to blend perfectly with the scene outside the window. The painting-within-the-painting features a very prominent tree. Following on from The Trechery of Images, you probably already have an idea of what this is about. There's an obvious juxtaposition between the 'real world' outside the window, and the 'fantasy' painted on the cavas; taking one step back, we must also remember that the 'real world' outside the window is also a fantasy painted on an actual canvas. (If you're enjoying this, you may also want to consider that you are not looking at a canvas, but a digital image of a canvas, etc, etc.) In this regard it makes many of the same points about the boundaries between fantasy and reality, the difference between images and actual objects, etc. 1) Is the tree real? 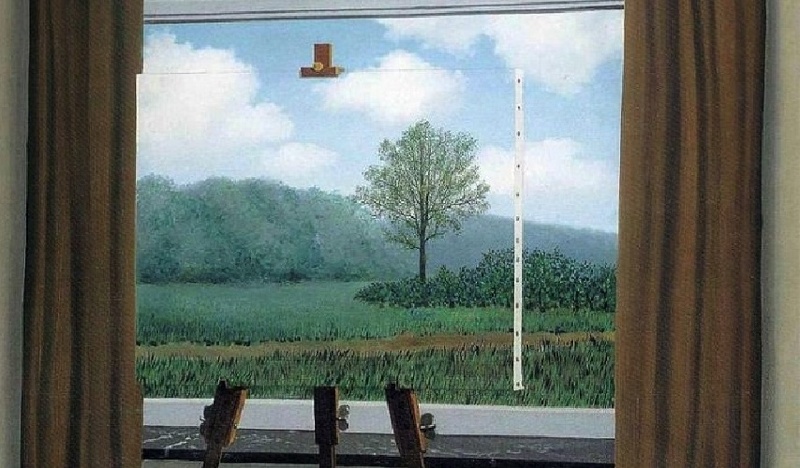 Obviously the tree isn't real - as we've discussed, this is a painting, not reality. But does the tree exist within the fantasy of the painting? Everything about the painting-within-the-painting suggests that it is a literal representation of the 'real world' outside the window. But because the canvas obscures the alleged tree completely, it is impossible to know whether the tree exists outside the window, or if it has been added in a flight of creative fancy by the fictional artist. There is a large gap in the 'reality' of the painting which we cannot observe - all we have to go on is the painted testimony of the fictional artist who suggests the tree exists, even thought this is clearly unverifiable. 2) More importantly: Does it matter? We know that the only testimony we have regarding the existance of the tree is unverifiable. But is that uncertainty a good enough reason to assume there is no tree? Alternatively, what if the painting-within-the-painting is, in fact, obscuring a herd of cows? There's no evidence to suggest this, but in the absence of any other information, it seems no less likely than that tree being there. The only reason we think the tree might be there at all is because someone suggested it, but what good is that really? Why assume that the fictional artist is telling the truth? We cannot make any rational claim as to what lies behind the painting-within-a-painting. But are we, as human beings, comfortable with accepting such a large blind spot in our perception of reality? When you look at the painting, does it not feel natural to view the scene outside the window and the painting-within-the-painting as being consistent with each other? The real philosophical question here is whether we prefer known-unknowns to assumptions, and whether it's really wrong if we don't. Taking a step back, is there any benefit to us differentiating between the fantasy of the main painting and the fantasy of the painting-within-the-painting? Perhaps we should just shrug it off - the whole thing is only a painting, after all. But if we shouldn't care about fantasy, what is the point of art and literature anyway? To put it another way: Does kayfabe matter? I think the message behind this painting is that the titular "human condition" is to subconsciously blend fantasy with reality - to create narratives and fall back on assumptions to cover troublesome gaps in our perception. That we sometimes accept ideas that fit our established perspective without duly interrogating them; that we, in fact, consider them to be our 'established perspective' sometimes, without actually establishing anything. Keeping up so far? Don't worry, we're heading towards games now. The branch of mathematics concerned with the analysis of strategies for dealing with competitive situations where the outcome of a participant’s choice of action depends critically on the actions of other participants. Doesn't that sound like a lot of videogames? I certainly think so. If you're not sure about that third point, think of it this way: You don't win a game simply by being good at the game - you win by being better than your opponents. The outcome depends on everyone's actions, not just your own. ...a question begins to nag in the back of your mind. Game theory may apply to competitive multiplayer games, but what does this mean for non-competitive games like Left 4 Dead, or singleplayer games like any singleplayer game ever? (A quick note for anyone now muttering to themselves about computer-controlled enemies: Until genuine artificial intelligence is developed, those NPCs are simply performing calculated reactions - they do not 'make choices' the way sentient human agents do.) There's an obvious answer, although it's one that requires you to carefully conceptualise what words mean in context. In my own personal nomenclature I think it's essential to differentiate between a "game" in this mathematical sense and a "videogame" - the software objects we're actually interested in talking about. When people talk about defining what games are, they are - in my terms - trying to define what videogames are. Perhaps the most high-concept implication of this definition is that a videogame is not necessarily an authored project. Trying to type rude words on a calculator could be a considered a videogame in this definition (with rules like "the word must be legible" and "the word must be rude"). But why not, right? And, within concepts like paidia and folk games, there's no reason why a player can't be making up and discarding rules as they go along. You could theorise a nameless videogame in which the objective is to develop interesting rules through playful experimentation; it would look an awful lot like someone titting about with a calculator, but I'd still call it a videogame of sorts. One of my key influences in this regard is Espen Aarseth's Cybertext, which is a book about 'ergodic literature' - stories which only emerge as a result of non-trivial input by the reader (if I'm remembering his terms rightly). The phrase "non-trivial" probably sounds contentious, but... well, you should read the book yourself if you have questions. It basically means actions more meaningful than simply linearly turning over the pages of a book. You should still read the book though, I thought it was very good. One example is Raymond Queneau's Hundred Thousand Billion Poems. It exists as individual lines of poetry - fragments of literature - printed on strips of card which the reader must assemble in some kind of order before they can 'read' it. Shuffling a few bits of card around hardly requires effort, but it's a meaningful action in that it determines the specific poem presented to the reader. Another example was that of heiroglyphs in Egyptian tombs and temples - how narratives would spill out across the walls of these structures following multiple threads. To 'read' the narrative of a tomb requires the reader to make conscious decisions about the order in which they will move through the rooms; in other words, they must choose which narrative thread they will follow at any given time. The tomb's narrative content is fixed and permanent, but the reader's experience of the narrative within the tomb is determined by their actions. As it happens, I wrote my MA thesis on the use of perspective as a gameplay mechanic - exploring ideas on how to give basic camera controls a more 'active' gameplay role. I talked about things like photography in games like Dead Rising, and the concept of perspective in classical literature like Orpheus in the Underworld. Given the amount of research I've done into this specific topic of perspective-as-gameplay, I find it really funny when people say "walking simulators" like Gone Home are not games. There is narrative content baked into the world of Gone Home - the letters, the environmental details, etc. It's all just kind of lying around there, waiting to be discovered. But, similar to those Egyptian tombs, an individual player's narrative experience within Gone Home only emerges as a result of the choices they make while walking around the house - where they choose to walk, where they choose to look, whether they noticed certain incidental details, etc. There are sidestories they might miss out on completely if they focus solely on the mechanical progress of unlocking doors and reaching the end credits - arguably, the more of this non-essential content there is, the more game-like it becomes. The goal of Gone Home is to make sense of what happened at this young woman's family home, and the main rules are that you must find objects through exploration, and that certain doors require you to find particular key items to unlock them. And yes, you play the game on a computer. Gone Home, like Skyrim, is not a game in the mathematical sense. It is however a videogame, and that's really all that matters in this context. I've had some interesting conversations about this subject recently - sometimes with anonymous randos, but also with experienced designers. It's interesting to hear people philosophise about subjects close to your heart in a way totally at odds with your own views. I don't really have a problem with people having different ideas about what games are, or what constitutes game design, although it becomes a bit intellectually suspect when people imply theirs is the One True Answer. My favourite metaphor for game design is car design. The aesthetic elements of car design do not have a meaningful impact on the mechanics of the car in question - whether your Punto is dark blue or lime green, it's going to handle on the road like any other Punto. But these aesthetic elements do have an impact on your experience of driving the car. If someone sprays offensive graffitti down the side of your car it's going to make you feel more self-conscious about driving it around town, although nothing mechanical has changed. I think of videogames in the same way. Deep inside, they have a cold, mechanical heart of coded relationships and reactions - if you collect 100 pips you get one extra life, and so on. But players cannot engage with abstract mechanical concepts - they must be given some kind of form, and deciding what form they should take is an aesthetic decision. Collect 100 coins to gain an extra life. Collect 100 souls to gain an extra life. Collect 100 hearts to gain an extra life. Mechanically these rules are identical, but aesthetically they shape the player's understanding of what an extra life represents within the fantasy of the game. For me, the concept of game design covers all of these aspects - the mechancal elements as well as the aesthetic. The mark of good design is when mechanics and aesthetics support each other. I've heard people who focus on mechanics argue that "a game without mechanics is just a movie", but in the same vein one could say that a game without aesthetics is just a formula. I think good design means understanding that both elements are critical. It's one of the reasons I think Hideo Kojima is such a great designer. A lot of people gripe about the length of cutscenes in his games because cutscenes aren't interactive - that common joke that Kojima is a film director trapped in the games industry. But all those cutscenes create a dense and detailed narrative around the player's actions - they give the player a strong sense of purpose, and amplify their sense of agency. In defeating Sniper Wolf, you have not only unlocked a door to progress the next area but also killed the woman your friend loved, which impacts the rest of his (fictional) life. To hark back to my thoughts on Rhythm Tengoku, aesthetics are what make videogames more than just 'pushing buttons when prompted'. Kojima understands that his games are not just abstract concepts of interactive systems, but multimedia entertainment products. He uses a much more varied toolset to entertain players than most other designers in his position - cinematic cutscenes yes, but think too of the times he's used pre-release marketing tools to misdirect players, or integrated real-world objects like the Metal Gear Solid game box into the game itself. I think the reason he's so adept at this is because he has some highly developed ideas about how these layers of fantasy and reality relate to each other. Learning to differentiate between the conceptual mechanisms at the core of games, the aesthetic designs that give these concepts form, and the software objects we call 'videogames' is, in my view, much like learning to differentiate between the concept of a pipe, the image of a pipe, and an actual oil-on-canvas painting of a pipe. To borrow a concept from Žižek: If you want to develop a critical understanding of games - as a critic, or a designer, or whatever - it is not enough to take the red pill of mechanics or the blue pill of aesthetics. You require a third pill, to reveal the mechanics of aesthetics and the aesthetics of mechanics. What real-life social systems led to a particular narrative decision? What kind of artistic statement does the structure of a virtual economy make about real-world economic praxis? This is (basically) what Frank Lantz's excellent lecture at GDC this year was about. As consumers, I think people generally accept videogames at face value. Similar to The Human Condition, I think most players engage with games on all of these different levels at once without really thinking too much about where the mechanical 'game' ends and the aesthetics begin. That sounds natural - fantasy does matter - and it suits eveyone. But when lay gamers start to turn a more critical eye to games, they often fall into this trap of fetishing mechanics and interactivity over aesthetics. I think they are drawn to interactivity because it differentiates games from movies, and other linear forms of popular culture. But they lose sight of the fact that interactive systems are only one element of the multimedia entertainment products we call videogames, which players engage with holistically. I think the key to developing a more comprehensive understanding of games lies in examining other, related areas of play, culture and technology, just as Cybertext makes many observations about videogames by looking at non-digital forms of interactive literature. Quite what this "more comprehensive understandiing" will be is anyone's guess - I don't believe there's any one correct design philosophy that people should be groping towards. In order to refine your understanding of what games are, I think the most useful action is to study things which you think aren't quite games, and then try to construct an argument to show that they are. To quote my actual favourite philosopher: "By knowing that which exists, you may know that which does not exist." Videogames exist. You can put one on your head. "What games are" is a concept that has no basis or form in actual reality. Arguing about these socially constructed concepts in matter-of-fact, pseudoscientific tones - wringing your hands because there's no way to 'win' Animal Crossing but your internal fantasies can't quite paper over the notion that it is, in fact, a game - makes you sound like a dickhead. Don't be a statistic. Your personal philosophy about the nature of games and game design is just as relevant as anybody else's, and it's good to share opinions and change your mind based on what others have said, but don't lose sight of the fact that we're all just developing our own personal understanding of an intangible cultural concept.